A new treatment for osteoporosis provides major improvements in bone density and more effective protection against fractures than the current standard treatment. These are the findings of a study published in the New England Journal of Medicine (NEJM). 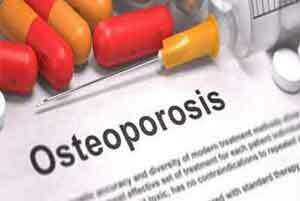 The study is the first that compares the effect of two osteoporosis medicines on fractures. “With the new treatment, we could offer significantly better protection against fractures and could thereby help many patients with severe osteoporosis,” says co-author of the study Mattias Lorentzon, Professor of Geriatrics at the Institute of Medicine, Sahlgrenska Academy, and Senior Physician at Sahlgrenska University Hospital. Many patients with severe osteoporosis and a high risk of fractures often cannot regain their original bone strength. They continue to have fractures even with treatment according to current standards with alendronate in tablet form every week. Alendronate increases bone density by slowing the breakdown of bone and thereby decreasing the risk of fractures by 20-50 per cent. Many people with osteoporosis, especially elderly women, nonetheless continue to suffer broken bones, sometimes just by falling from a standing position. The fractures lead to disability and suffering, and with hip and vertebral fractures, often premature death. The current study included 4,093 women, of an average age of 74 years, with osteoporosis and previous fractures. They were randomly allocated to 12 months’ treatment with either alendronate or the new medication romosozumab, an antibody that blocks the substance sclerostin, which slows the new formation of bone. Treatment with romosozumab thereby leads to rapid new bone formation. After the first 12 months, all patients received alendronate for 12 months. The risk of vertebral fracture in the course of the study proved to be 48 per cent lower for those who received romosozumab compared with the group that received alendronate the whole time. The proportions suffering fractures in the two groups were 6.2 per cent and 11.9 per cent, respectively. The risk of a clinical fracture, such as an arm or leg fracture, was 27 per cent lower in the group that received romosozumab. Here, the proportions suffering fractures in the different groups were 9.7 per cent and 13.0 per cent, respectively. The proportion of side effects and serious side effects was generally just as common in both of the treatment groups. However, it was observed that serious cardiovascular events, such as heart attack or stroke, occurred in 2.5 per cent of the patients that received romosozumab compared with 1.9 per cent in the group that received alendronate during the first 12 months of the study. According to Mattias Lorentzon, the safety aspects of the new medication need to be studied further. However, an earlier study of nearly twice the size showed that romosozumab does not provide a greater risk of cardiovascular events compared with a placebo. “With romosozumab in the treatment arsenal, we could prevent many fractures among the high-risk patients,” he concludes.